MOSCOW, January 21. /TASS/. The Syrian military and militia encircled a big grouping of the Jabhat Al-Nusra terrorist organization (outlawed in Russia - TASS) in eastern Idlib, and liberated from militants the Abu Duhur airport, Russia’s Defense Ministry reported on Sunday. 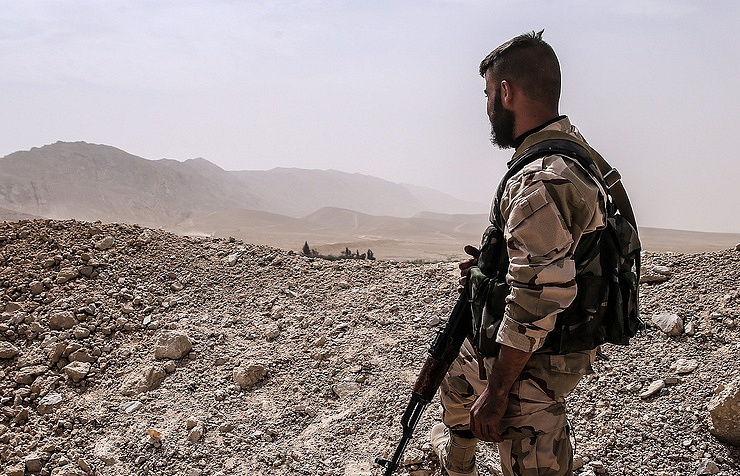 "Assault troops of the Syrian governmental forces under command of General Hassan Suhel, while advancing along the road connecting Hama and Aleppo, joined the militia units near Herbet al Ghajar and Rasm al Harmal," the ministry said. "Thus, they have completed encirclement of a large group of terrorist belonging to the terrorist organization Jabhat Al-Nusra in the eastern part of the Idlib Province." Besides, the ministry said, during the assault, the Syrian military repelled militants from the Abu Duhur airport, which had been under the terrorists’ control since September 2015. Earlier reports said the militants’ defense was broken after fierce battles, the terrorists were knocked out of seven villages located in the airfield’s vicinity. Three years earlier, Abu Duhur was the Syrian army’s last stronghold in that northwestern region. The bandits continued the siege for six months. Military actions against Jabhat Al-Nusra’s terrorists and their allies continues for more than a month in Syria’s north-west. Over this period, the armed forces and militia destroyed more than 600 militants.